Sunday morning, after giving my pups a smooch and handing the keys off to their sitter, I packed my paints and pochade box into my VW wagon and drove south. I arrived in LA just in time to catch the last hour of the California Art Clubs Annual Gold Metal Exhibition before closing for the night. After geeking out on the fabulous collection of representational paintings, I hit the street to explore the town and find dinner. I settled on sushi and was not disappointed. I found my way to Judson Studios Monday morning and was enchanted with the early 1900 architecture. The sun glowed through the stain glass windows of the glass studio, but they weren't the only thing glowing that day. Students and I huddled around luminary Michelle Dunaway, an artist of rare perception, soaking in her rays of painting knowledge. Michelle Dunaway showing us how she starts portraits - working from the eyes (focal point) out. Very interesting approach! Not only did I find a spring of knowledge from Michelle, but also from my peers. I practiced new painting approaches, paint colors, brushwork and techniques. A fellow contemporary, Natalie Lundeen and I struck a friendship and explored the city outside of class. Sharing a passion for art and similarity in age, we enjoyed swapping artist names, shows, and finding inspiration while exploring Los Feliz and Silver Lake. I even had the pleasure of seeing a life size "David" replica. As if my trip couldn't get any cooler, it did. My longest friend (I'm talking 20+ years folks!) and I spend the day in Santa Monica. We ate a leisure lunch at Blue Plate Taco while looking out onto the ocean shoreline. I fell in love with the coast when I moved to CA over 4 years ago. Getting to stroll along the boardwalk, stick my bare feet in the sand, and soak up the rays in addition to the previous day highlights, made it an epic trip. 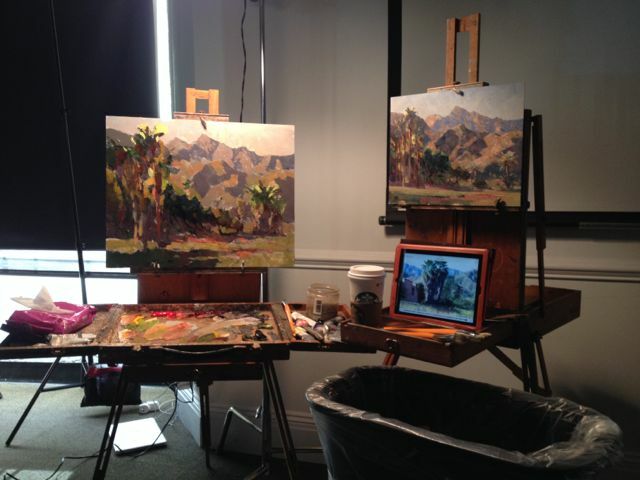 Craig Nelson, Oil Painter and Director of Fine Arts at AAU, gave figurative demos through out the weekend. This demo was about quick studies. Craig was one of my instructors at AAU so it was fun to learn from him again. 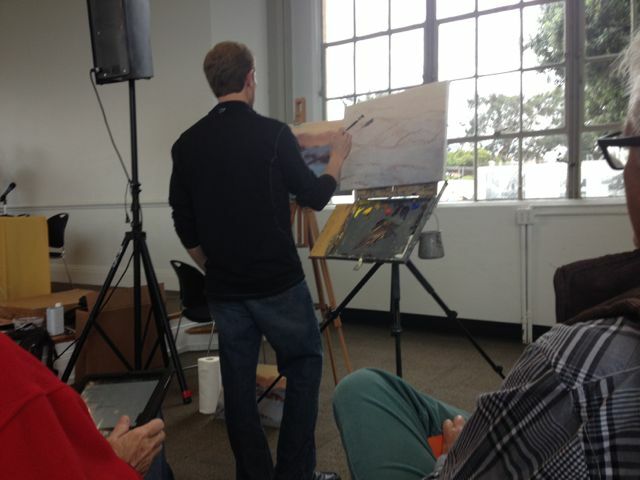 Artist Jesse Powell, of Carmel CA, showed us how he takes a color study and paints it larger in his studio. I always love watching other artists paint. Every painter has different approaches, techniques, process and color palettes. Seeing artists paint live can inspire me to try new approaches or just spark inspiration in general. Artists - do you work too much? Or not enough? I recently read an article about creative minds and the conflict of managing time. Creative People say No hits the nail on the head in my opinion. I've often struggled with having all these wonderful opportunities - outing, trips, dinners, etc. surrounding me but feeling the pull of fleeting time and not enough of it available to create. Now be honest - do you have some artist friends who seem anti social at times? Are they painters, sculptors, musicians, or writers? This is a constant battle in my own life. I think friendships, outings and activities are essential to my creative mind and life in general, but it has to be harnessed. If you don't learn how to say "no" and put in the time and hard work, your demeanor as a creative mind will suffer along with your production. I am a career artist and I treat it like any other person would treat their career. I have a work schedule and hours that I am at work, even if that means I work out of my home studio. Doing this has helped me greatly to balance artist life with social life. And sometimes when I am hanging out with friends at museums, art shows, painting trips, they cross over and are both work and play at the same time. So to all my creative friends and colleagues, be aware of your creative time and the importance it plays in your life. The inspiration is already there, you just have to give yourself the quite environment for it to percolate. To everyone else engaging with creatives, give them a hug next time you see them and thank them for the beauty and inspiration they bring into the world. "Creative People Say No" is written by Kevin Ashton - you can click here to read his article.